Whenever I have thought about getting a pet for myself and the incumbent Mrs B, a gee gee has never really sprung to mind. I know they’re lovely animals and all that, but you could never sit on the sofa watching a weepie with a 3/4 Arab laying at your feet, or send your 15 hand Palomino round to Mr Singh’s to pick up the Grauniad on a sunday morning (that’ll be after they adopt Mr Murdoch’s 7-day publishing ruse, which they surely will), and keeping a(nother) stallion in the the house would play havoc with The Incumbent’s carpets. 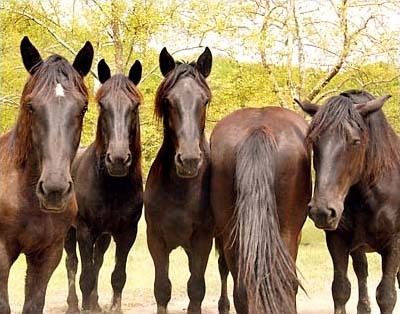 No a horse is not for us, and even if it was we couldn’t afford one. I mean have you seen the price of one ? And it’s not if there’s anywhere you can just hire one or loan one out. Oh , hang on a minute, there is ! It seems Rebekarhhh Wade loaned a nag from the Old Bill. There is a (very) little-known scheme in which the boys in Blue lend out their old dobbins to selected members of society to ride them ragged and return them in poor health in the twilight years of their lives, just before poor old horsey snuffs it – as happened in this case with Wade’s borrowed nag called Raisa (which would also explain what happened to Mrs Gorbachev). As an aside, yes I know Rebbbekah pretends she’s married now and her name is now Brooks, but she says a lot of things and pretends much, so I have no reason to believe her when she says she’s married any more than I believe her when she says she knows nothing about phone hacking. And anyway, who’d really marry that ? Yeuch. 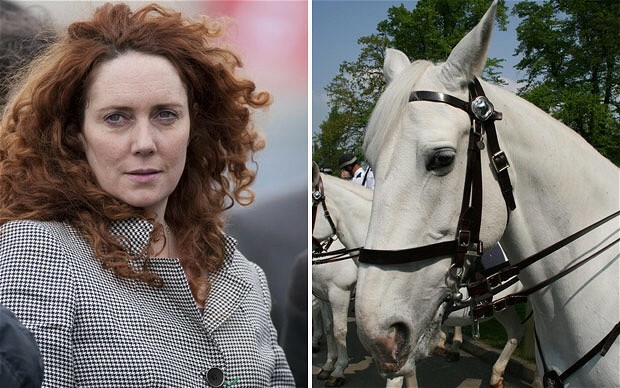 According to The Telegraph “Met Commissioner Bernard Hogan-Howe expressed his surprise at the arrangement saying there was a lengthy waiting list of people who wanted to re-home former police horses.” But then again few in that lengthy waiting list have furnished the boys in blue with massive wads of cash for privileged info like Rebekahkaka and her mates have. At least I would hope not. There is a lengthy queue of hacks, Masons and MPs waiting to donate sackloads of bunce to plod in return for preferential treatment, of course. The paper also added that when the horse was returned by Wade (who, funny enough pretends to be married to a racehorse trainer) “Raisa was regarded by officers from Mounted Branch to be in a poor but not serious condition.” Perhaps her “husband” didn’t have any spare nags lying around to loan to his “wife”, nor did he have time to look after the beast properly. But I suppose if mass, consistent and organized bribing of public officers can’t get you the last few miserable years of a working horse’s existence, what does it get you (apart from an enormous pay-off and the unflinching backing of one of the most powerful men in business) ? But money, mass corruption, animal cruelty, and fraud aside, a horse has never been for me. 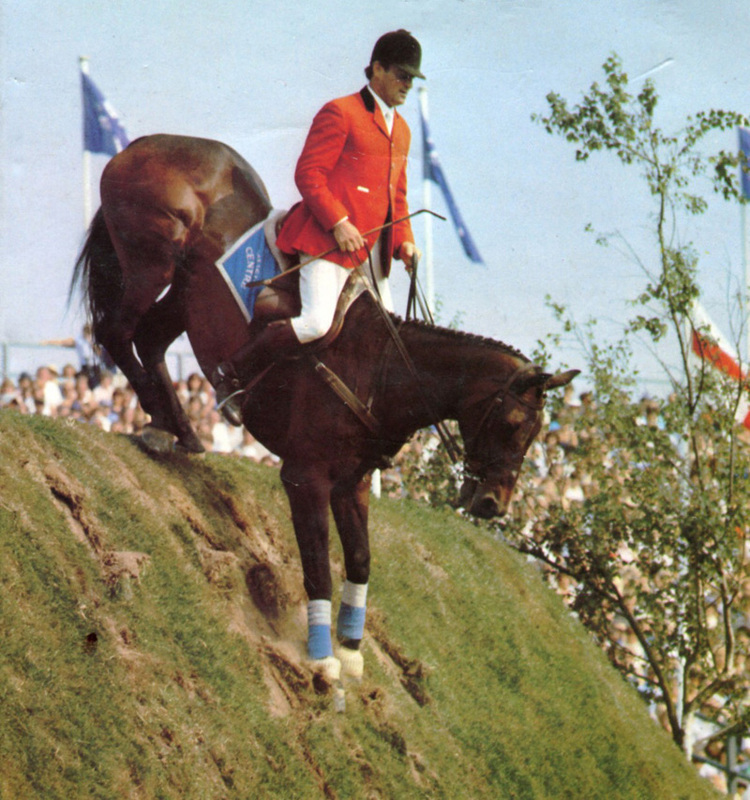 When I was a kid my mother would always turn on The Horse of the Year Show to watch Harvey Smith and David Broom, resplendent in their red hunting outfits take their mounts over the jumps at Olympia, or Wembley or maybe Hickstead, ably commentated on by the BBC’s Raymond Brooks Ward (or Raymond Wade Ward as he was known in our house). “C’mo-o-o-n Da-a-a-vid” he would shout though the mic. Which was odd because Princess Anne was in the ring at the time. But who knows what he was thinking of ? But while mum was jumping up and down during the jump off against the clock, my brother and I were waiting for the gee gee to slam on the anchors and the jockey vault over the handlebars into the wall/hedge/water below. It was our only enjoyment gleaned from the event. We didn’t want the horses harmed, but cared little for the powdered ponces sat astride them. A similar thing happened when I watched War Horse last night. 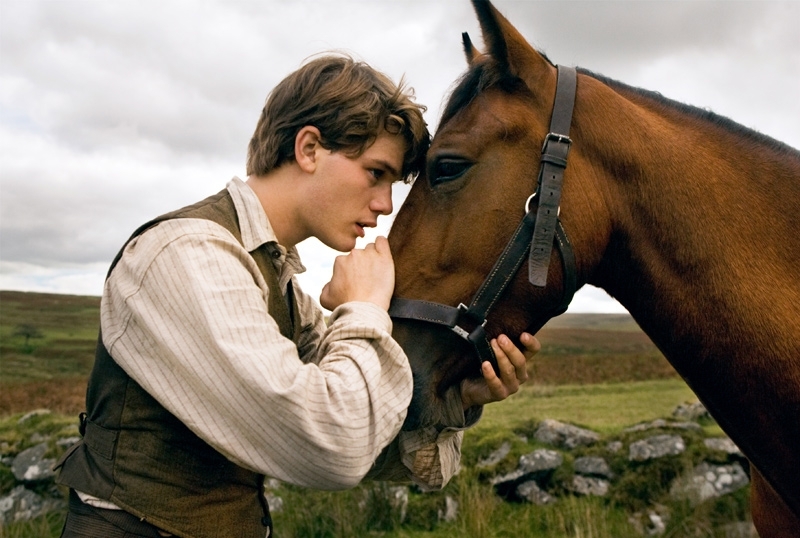 The lead actor was riding the eponymous hero through the field when they approached a stone wall. The horse came to a sudden halt, through its rider up and over, through the air and eventually onto his arse. I didn’t want the horse hurt, I just wanted the rider to fly though the air, miss the wall, hit the camera full in the lens, shattering metal and glass, which then speared Steven Spielberg, the writer (one can only assume there was one) and the producers of this shite into each other and impaled them all onto a barn door behind. The rest of the cast crew and horses could then mount (geddit??) an asserted and brutal attack on all those who forced such a woeful excuse of a movie onto the general public. After the end of the first war, we’re back in Blighty , Devon (apparently), which is indicated by the huge red sky, piercing evening sunlight with the embers of Atlanta burning in the background. Joey (our horsey hero) is back home after his labours, and surrounded by his fiends and family: Albert, Ted, Rose, Uncle Sandy, Ricky, Old Shep and Bernard Cribbens. All of a sudden Skippy and Flipper hove into view and tell Joey the whereabouts of Lee Van Cleef’s buried treasure. Everyone hugs and laughs and Albert marries Jenny Agutter who, in a moment of sobriety, has forgotten to take her clothes off for this scene. Or it may as well be.